This insert is designed to fit over the fireplace, under the shelf in a custom-built fireplace mantle. It is made of redwood, carved and lacquered in its natural color. 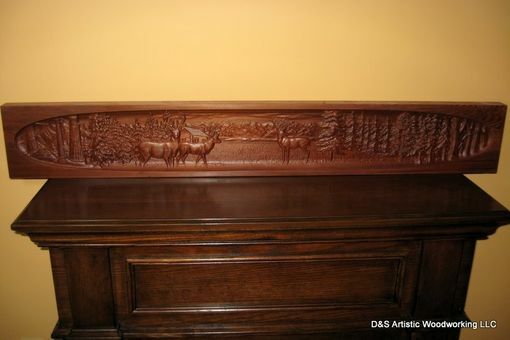 The carving features a group of deer grazing outside a cabin in a mountain setting. The insert is 48" long by 7" wide by 1.25" thick. 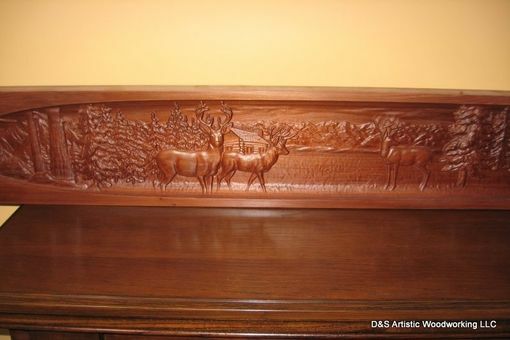 This would fit into a country-themed, or log-cabin type decor. The mantle is custom designed and the elements can all be changed, including the animals and scenery. We can also do this in a variety of woods. In addition to redwood, it could be done in walnut, maple, hickory, pine, aspen, or other woods. We would recommend against oak as the strong grain of the oak tends to overpower the carving.